The largest single source of economic loss across North America in 2018 was due to the record-setting rainfall that Hurricane Florence brought to the Carolinas. Particularly in the wake of Harvey’s unprecedented rain in 2017 and the accompanying exceptional amount of economic loss, the protection gap between insured and economic losses is expanding. While Florence was one of the nation’s wettest storms, the amount of rainfall in North and South Carolina was still only third of what Texas experienced during Harvey in 2017. The top two highest rainfall amounts from Atlantic or Pacific tropical cyclones across the U.S. in nearly 70 years took place in the past two years alone – Harvey in 2017 and Lane in 2018. Out of 37 states with the potential for Atlantic hurricane occurrence, five have experienced the highest rainfall on record since 1930 in the last eight years: Florence, Harvey, Ike, Sandy and Irene. Include Hurricane Lane’s record breaking rainfall in Hawaii in 2018, and the last decade has featured above average exceptional hurricane rainfall totals. What are some of the leading reasons behind the recent historic state rainfall events? A warmer atmosphere is capable of holding more moisture, with a one degree Celsius rise in atmospheric temperature increasing storage of water vapor in the atmosphere by 6-7%. Warmer sea surface temperatures allow for increased evaporation of ocean water into the atmosphere as water vapor. One study conducted after Hurricane Katrina (2005) determined the potential for a 19% increase in peak rainfall totals for an additional degree Celsius increase in sea surface temperature. Sea surface temperatures near Hawaiii during Hurricane Lane in 2018 were in excess of 3 degrees Celsius above average. Less well proven, but a meaningful factor in Harvey and Florence, is the possibility of stalled tropical cyclones due to blocking ridges of high pressure north of the tropical system. There is a potential link to changes in the breadth of the Arctic ice sheet that influence jet stream configurations. The ultimate impact is the potential for stagnant jet stream patters, which can prolong weather regimes as well as hurricanes to curve back towards the U.S. at high latitudes. With these factors shifting the risk profile for extreme outcomes, we will discuss the specific impacts of the most notable event in the 2018, Hurricane Florence. Hurricane Florence made landfall at 07:15 AM US EDT on Friday, September 14, 2018 near Wrightsville Beach, NC as a category 1 hurricane. Due to the category 4 strength of the hurricane just 36 hours before landfall (see Figure 2), Florence produced life-threatening storm surge up to ten feet along the Carolina coastline. Once over land, the forward motion of the storm decelerated to three miles per hour. Over the next several days, the hurricane delivered historic amounts of rainfall across North and South Carolina. A new record rainfall total of 35.93 inches within a four day period was set in Elizabethtown, NC, exceeding the previous state record for rainfall from a tropical system of 24.06 inches in Southport, set during Hurricane Floyd in 1999. In South Carolina, the highest total rainfall reported was 23.63 inches in the city of Loris, also the highest recorded total rainfall for the state from a tropical cyclone, exceeding the previous total of 17.45 inches during Tropical Storm Beryl in 1994. As a result of the extreme rainfall, catastrophic inland flooding occurred over portions of North and South Carolina. More than 40 deaths were attributed to Hurricane Florence along with extensive property damage; economic loss estimates in North Carolina are in the range of roughly US$38­50 billion according to industry experts. A detailed hydrologic analysis performed by the United States Geological Survey (USGS) revealed that 18 streamgages in North Carolina and ten in South Carolina registered record-setting water levels. USGS streamgages are active, continuously functioning devices which measure water flowing in streams and rivers, as well as river heights, on a daily basis. This data, in addition to flood frequency analyses performed by USGS, can provide insight into the severity of peak streamflows at varying probabilities – built into an annual exceedance probability curve. Figure 4 shows all 28 record setting streamgages and the level of probability of reaching or exceeding that amount of water (in cubic meters, often translated to flood height) in a given year. 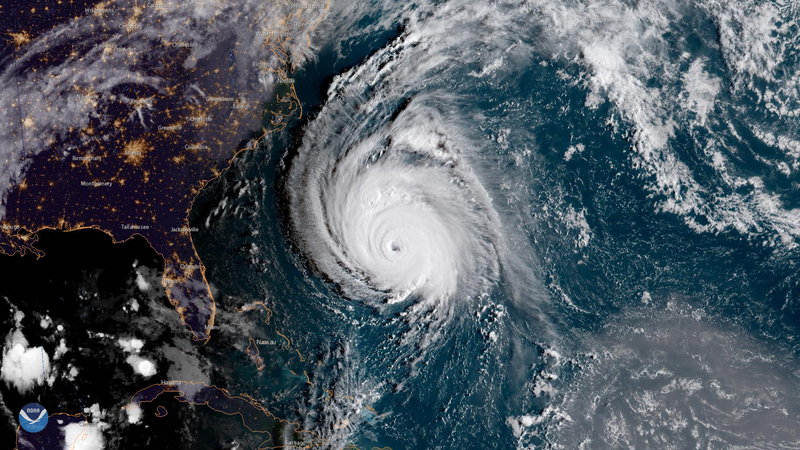 To assess the flood risk for any real-time hurricane event, including Florence, JLT Re has established a strategic plan to evaluate the widespread impact on a given geography. A detailed methodology has been developed to create a reliable flood footprint, with two major flood components: storm surge and inland flood from rainfall. With the wealth of resources now available, both in the public and private domain, it is possible to aggregate multiple data sources to create a hazard assessment leveraging strengths of various approaches. For storm surge, the inundation area paired with flood depth information can be imported into JLT Re’s spatial analytics tool, CATography, to evaluate coastal flood extend and severity on coastal risks. For inland flood from rainfall, JLT Re has also analyzed the inland flood footprints of Florence with flood depth information relative to a number of public and proprietary sources. JLT Re performed a validation study using the peak river gauge recordings from USGS and the National Oceanic and Atmospheric Administration (NOAA), remote sensing data as well as precipitation verifications. Continued inflows of capital into the (re)insurance marketplace afford opportunities to offer private flood coverage at actuarially sound rates. There is an underinvestment in widespread resiliency efforts, where dollars invested are increasingly proving a meaningful return on investment for communities and public entities relative to the liability of post-flood recovery. In certain regions of the country, there are increasing correlations between flood risk and climate change. As this risk evolves, the Federal Emergency Management Agency (FEMA) flood zone updates of National Flood Insurance Program (NFIP) maps aren’t always fully current in their assessment, let alone accounting for plausible future flooding projections. Roughly one in ten homes has flood insurance, meaning that the balance will potentially get assistance from the FEMA – whose program is currently running at a loss. While many flood-leakage losses during storms like Sandy were ultimately paid out by wind policies, such policies generally do not cover losses from flood. This is doubly the case when homeowners are under the assumption that they are protected by the wind policy for flood. The general public lacks a clear understanding of flood risk, further fueling the low take up rate of such coverage; therein lies the need for better education on coverage availability and standard exclusions. As flood insurance continues to evolve across the U.S., inclusive of the changing landscape of the National Flood Insurance Program and the strengths and shortcomings of first generation catastrophe models to adequately rate flood for underwriting and portfolio management, JLT Re continues to invest in flood solutions, both for analytical and broking capabilities.